TacTracer #19 – No Man’s Lie? Hello everyone, it’s been quite a crazy few months for me but, I’m back with one interesting review…No Man’s Sky. 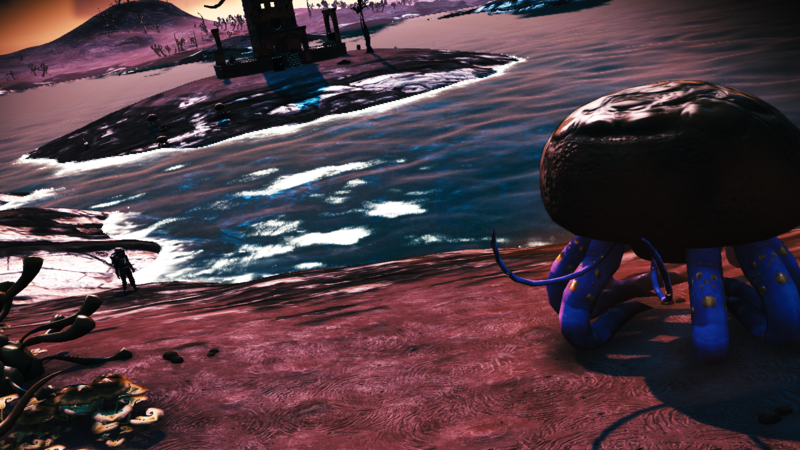 “But, TacTracer, No Man’s Sky is trash, the developers lied, and we hate it.” Yes, I will admit Hello Games lied but, no one gave the game a chance. Gamers would buy the game, idle in it so minutes would rack up, then refund it without even trying it out. That’s how the game had extremely negative reviews on Steam, gamers just bashed Hello Games, and not being informational. I have one hundred and forty nine hours on the game and love all the crazy things you can discover. This review is after the life breathing Next update that now has multiplayer support. Okay, let’s talk about the story? Yes, that was intentional with the question mark. The story is more of background filler unless you are really interested in the three alien races and the Atlas entity. Essentially, you are a travellar, a race that explores the universe to discover creatures, minerals, and plants as you boldly go where no one has gone before. When starting a new game, you always awaken on different planets as that’s the start of the story That’s really all I will delve into for the story as there really isn’t much to say without spoiling it. This is the main part of the review, the gameplay. As I stated, the game has you awaken on a random planet in the massive universe that has over eighteen quadrillion planets (Hope I got that right, kinda lost track) and you must repair your basic multi tool then your ship. It can be a repetitive process but, after you repair your ship fully, then the game becomes more fun as you then get to explore the whole universe. Crafting is key if you want to survive as is recharging your equipment, adding technology to your exosuit, starship, freighter, exocraft, and multi tool. S class upgrades are the best upgrades for technology but, the tech upgrades cost nanite clusters, not units. Units are the main currency you get from discovering and selling. In each system, prices differentiate depending on the economy on the galactic market. Nanite clusters are obtainable from finding them, being given to you from tasks, or uploading your discoveries to the No Man’s Sky servers. There are many different vehicles and multi tools you can get throughout your journeys. Each one is unique and has different inventory spaces including class and type. Multiplayer is the same as playing alone, it really is except, you can battle each other or help each other. The combat is basic and you pretty much go pew pew to what creature you want to go after. Now, onto the soundtrack. The soundtrack is something I was surprised I enjoyed. It felt relaxing, ominous, eerie, which is hard to understand unless you played the game. Some of the songs can be a bit long but, quite relaxing as you can almost picture travelling through space to the music. To summarize, the game has a background filler for story, the gameplay is the main aspect of the game, and the music is quite interesting to listen to when you feel relaxed. Soon I will write TacTracer issue twenty and am sorry for the massive wait. Previous: Previous post: Get a closer look at our in-house game, Tano’s Fate, this Friday!